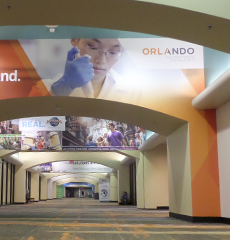 The Orange County Convention Center (OCCC) offers a wide variety of advertising opportunities. Your brand will reach the local community, market business leaders, meeting planners, exhibitors and guests that attend one or more of our 200+ events drawing nearly 1.4 million attendees per year. 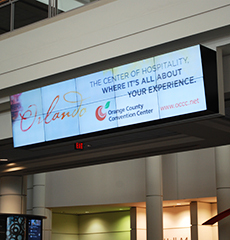 Target new customers on our digital signage located throughout our West concourse. Increase awareness of your company or services with dynamic ads. 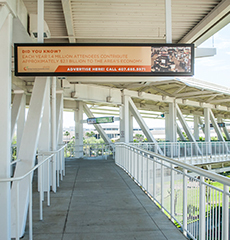 Our pedestrian bridge signage utilizes multiple spaces in high traffic walkways between our West concourse, North/South concourses and the Hyatt Regency Orlando. In our West building we have identified areas throughout our public concourses and walkways for static display advertising that provides the ultimate exposure for your company.